user: st2 will be for Windows, Linux and maybe other platforms if ppl help me port it. V1 will be a pure MIDI tracker but VST/sampling support is planned for V2. The tracker is progressing very well but it's not ready for prime time, yet. 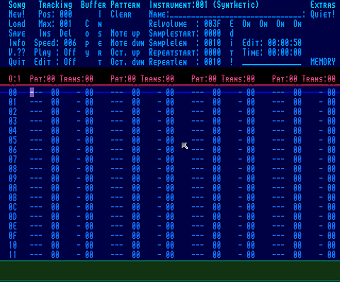 thx hermes... but talking about old amiga synthmuzax on windows, did you know the windows version of Brian Postma`s SoundMon Editor?? yes I've seen it and I highly appreciate his effort to keep SoundMon alive on todays hardware! Syntracker2 actually has nothing to do with the "old" Syntracker but I somehow liked the name and the fact that it was my first tracker.. but hey, you may even have convinced me to do a "syntracker 1.7" softsynth for it in the future :-) some things might be hard to "emulate", for example the really strange note-slide command that searched the pattern for the next note..d'oh! page created in 0.015507 seconds with 15 queries.